Do you decorate for Valentines Day? Or do you find it too much of a chore? I find myself being a little of both. I find that I drag my feet a bit when I think about decorating for Valentines Day. I don’t know if its because I am worn out from decorating for Christmas and winter, but I just don’t want to spend more time decorating for another holiday. However, I still find myself getting festive. There are many ways to add a little bit of Valentines décor to your home without spending a lot of time and energy doing so. Today I want to show you how I took a simple wreath, that can be used year round, and added some Valentines swag. What’s great about this is that it can easily be disassembled once Valentines is over and reused the next year. So, to start, I cut out 3 different sized hearts out of my ticking fabric. I just hand drew these, as they do not need to be perfect. I double over the fabric so there would be 2 cutouts of each heart. I took one of the hearts and glued a piece of twine right to the middle of the heart. I then ran hot glue around the edge of one side. I then applied the other heart to the top, pressing the edges together. Continue gluing around the edge but leave a small opening. How cute are those little stuffed hearts? Once they are all done, you can use creative license to hang them where you want. I wanted mine to hang together like a swag. I took the hearts and staggered their lengths and then tied them to the Evergreen wreath. I then hung it in my entryway. I always try to at least add something there, that way it can greet those people visiting my home. This may seem really simple, because it is! Decorating for Valentine's Day does not need to take up all your time. Spend that time loving those around you, and take a 30-minute break to make a super cute Valentines wreath that you are sure to love! This is my favorite kind of Valentines décor. It is simple and understated and works so very well with the rest of my home décor. Why not try one for yourself! Ah, I love a good faucet. 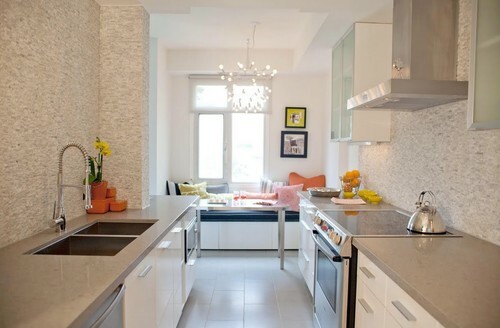 I think choosing the right faucet for your kitchen can make or break the whole space. 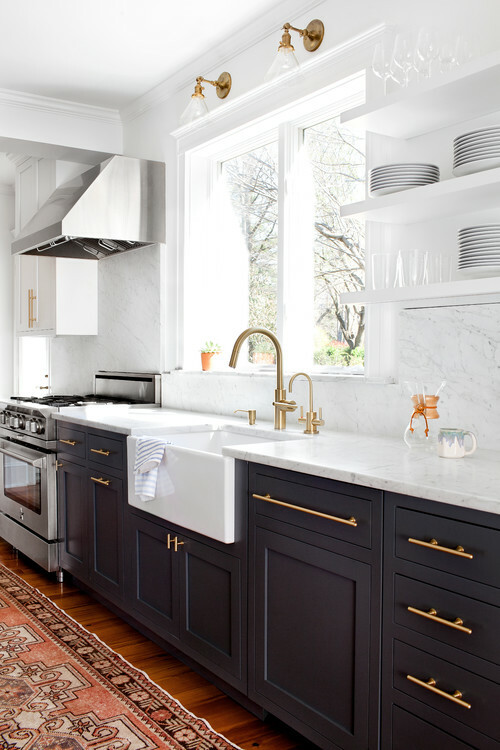 Imagine a carefully curated kitchen with just the perfect accessories and then you add a plain jane, run of the mill, stock faucet. 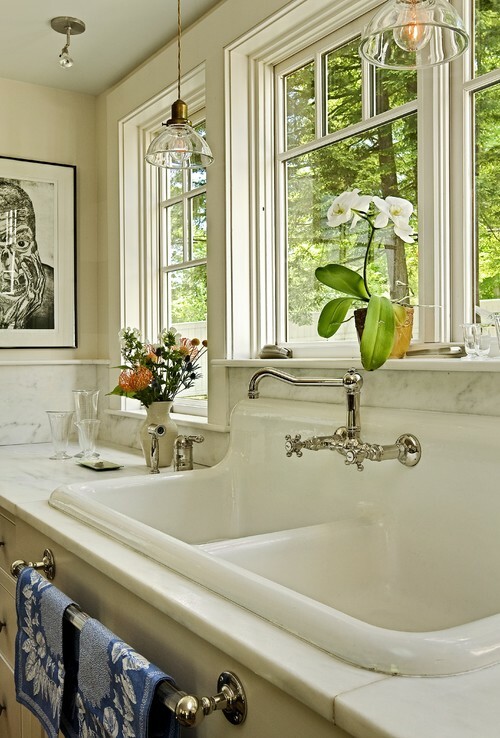 These days there are a few specific style faucets that are in the limelight. They are getting all the love, and for good reason. My absolute favorite faucet right now is the bridge style faucet. Here is a good example of this style of faucet. 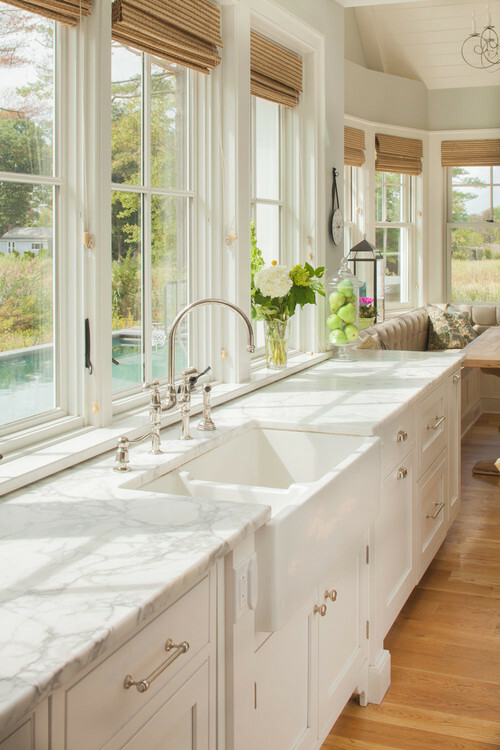 You will notice the delicate curves of the faucet, and that the entire faucet is raised above the countertop, only to be connected to the counter where the faucet handles connect with the water. They are connected with a “bridge”. 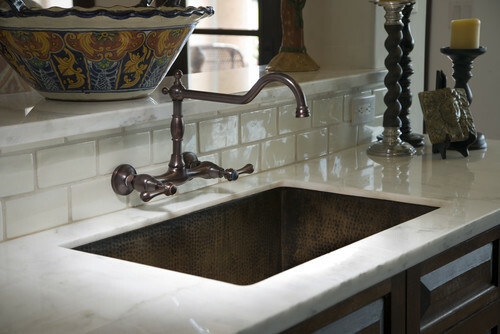 I love this style of faucet, and in fact, I have a copper bridge faucet in my own kitchen. The next style of faucet is actually another that I have in my house. It is the wall mounted faucet. I have these in my bathroom, but they are just as much of a showstopper when they are in the kitchen. Here is a picture of the wall mounted faucet in my bathroom. Here is a modern take on the wall mounted faucet. 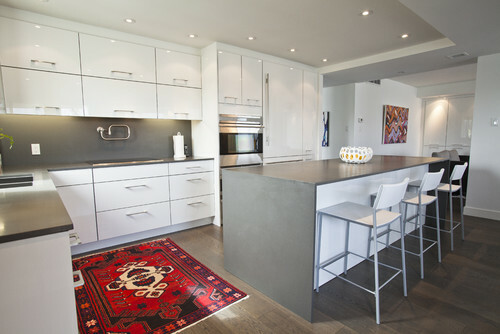 Love that Caesarstone countertop on the island and how it waterfalls over the edge. I still consider this a wall mount faucet, even though it is mounted to the sink. I love this look. This oil rubbed bronze wall mounted faucet is a show stopper! The next style of kitchen faucet is more of a minimalist and modern style. The high arc style kitchen faucet makes cleaning and prepping in the kitchen a breeze. Check out this gold faucet. These chrome high arc faucets are also a strong contender. Their sleek and contemporary design combined with some industrial elements allow them to be paired with many different kitchen styles. 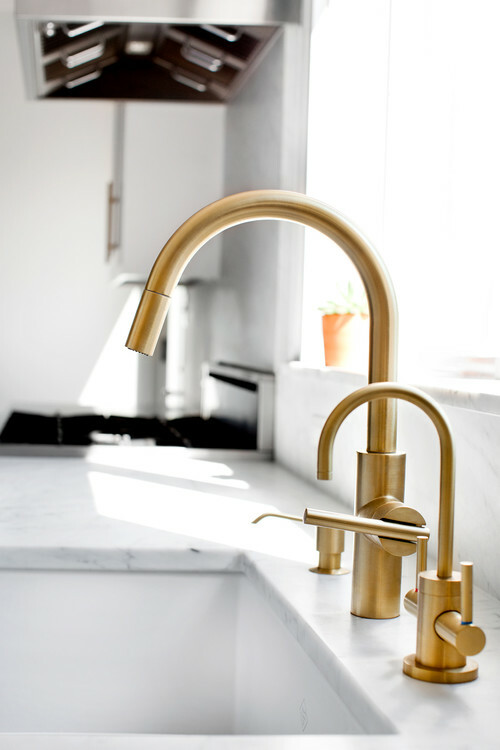 Gold faucets have made a big name for themselves recently. There has been an increase in popularity, and I have to say I am a fan of them. Don’t think of that old-fashioned brass your grandma had in her house. Think modern and sleek brushed brass. Keep it simple. I have a copper faucet in my home, which I love. It is basically the jewel of the kitchen. The secret is to keep it simple. 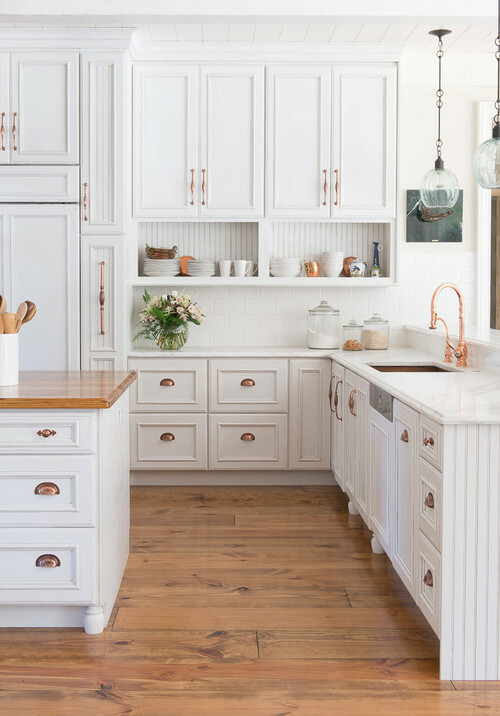 Don’t turn everything else into copper or gold, mix metals, and other finishes. If you are looking to update your kitchen faucet and want to make an impact, consider these design options. You cannot go wrong. While they are so very hot right now, they also carry a timeless look that will hold for years. 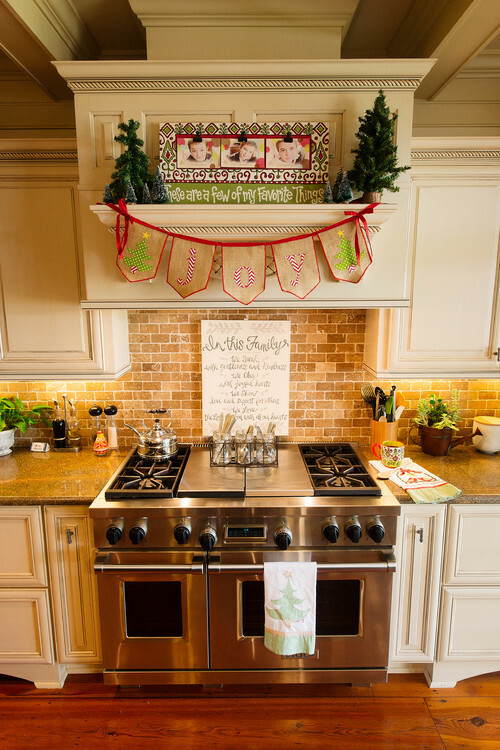 Do you decorate your kitchen for the holidays? I like to add a few simple elements to my kitchen just to add a festive touch. 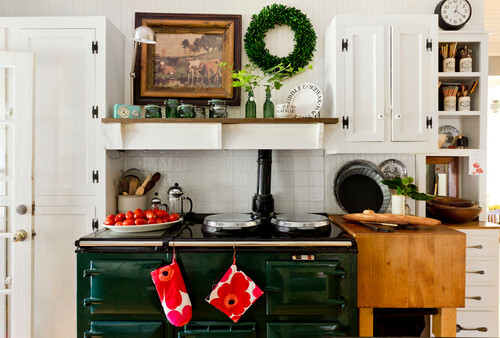 I am always looking for inspiration and have found 10 really pretty kitchens decorated for Christmas. Some of these kitchens are decorated simply and others are more elaborate. Whatever your style, you are sure to find one that you are drawn to. And speaking of kitchens you are drawn to, are you looking to remodel your kitchen? I found the coolest program on Caesarstone’s website. They have a site where you can create your own kitchen moodboard to design your own dream kitchen. Let me just say that I have had so much fun doing this and I have created about a million different options. 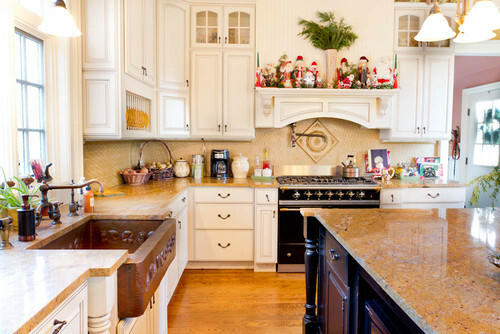 But before we get to that, let’s look at some really pretty kitchens decorated for Christmas! First off, check out this amazing kitchen and that showstopper green stove! I mean, come on. How perfect is that for Christmas? Add in a few simple Christmas touches such as wreaths and some green and red. 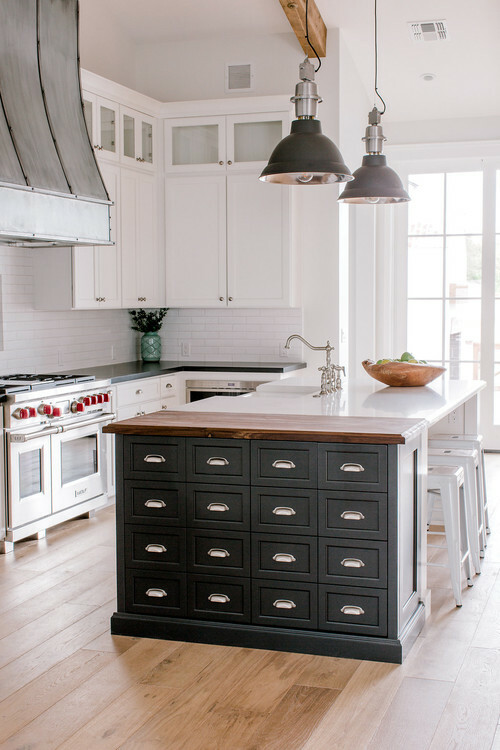 This kitchen looks beautiful with its rustic black cabinets and mismatched wood island. The simple Christmas décor is the perfect addition to this space. I am a big fan of open shelves in the kitchen, and this kitchen pulls them off well. I love the simple red wreath, touches of greenery, and other simple Christmas touches. There seems to be a theme going on don’t you agree? Simple is great! Now if you are into more elaborate Christmas décor in the kitchen, this one is for you. Its got some adorable Christmas décor. 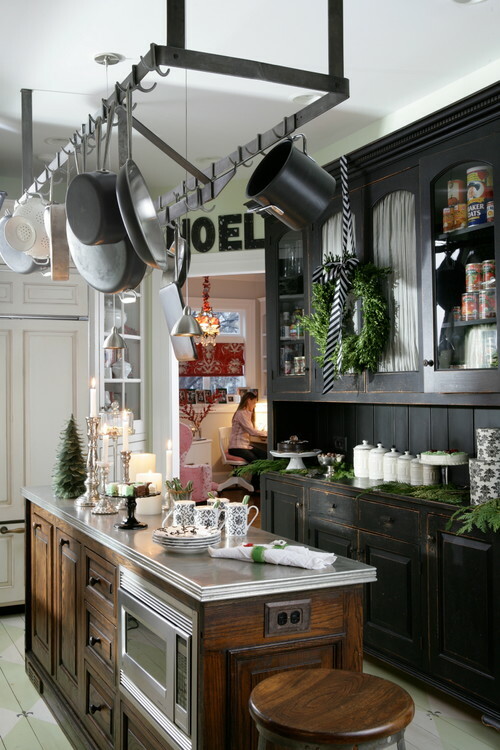 Who could not get into the holiday spirit in this kitchen? 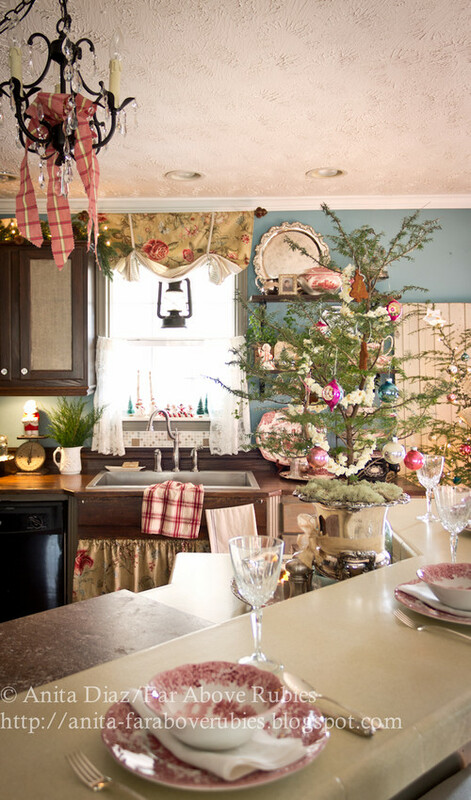 Here is another quaint kitchen full of Christmas décor. I love the small tree in the room! There are so many small details that add so much to the space. 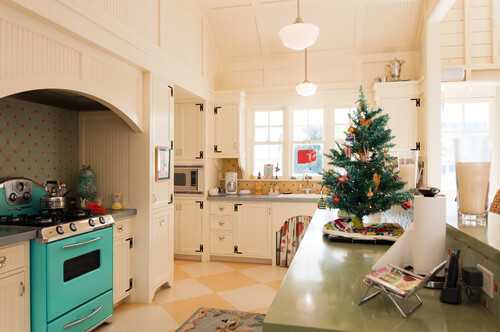 This kitchen has a more vintage feel, especially with that turquoise stove! The small Christmas tree is really all the décor you need! This last kitchen is really cool. I love the collection of nutcrackers above the stove. Such a great addition of Christmas décor. Now, for a little more fun. Have you ever played with or created a moodboard? As a design blogger, it is one of my most favorite things to create. Caesarstone recently collaborated with Sabrina Soto to create moodboards inspired by their 10 winter-warm countertops. You too can go over to this website and create your own. This is a great way to get inspired if you are looking to remodel a kitchen or are just starting out and want to create a brand new kitchen. Here are a few of my moodboards. As you can see I am a huge fan of vintage patterned rugs. I added a few Christmas touches to the moodboards too. I am absolutely obsessed with the countertop options and would love to install some of these in my kitchen. These moodbards are super easy to make, just drag and drop the items you love! Now here where it gets really exciting. Celebrate the holidays, and a renovation, with Caesarstone. Purchase one of their ten winter-warm colors between now and December 31, 2017 and receive $150 to Houzz by simply sharing a picture of your receipt and an image of your installed countertop. Click here to read more about this opportunity. 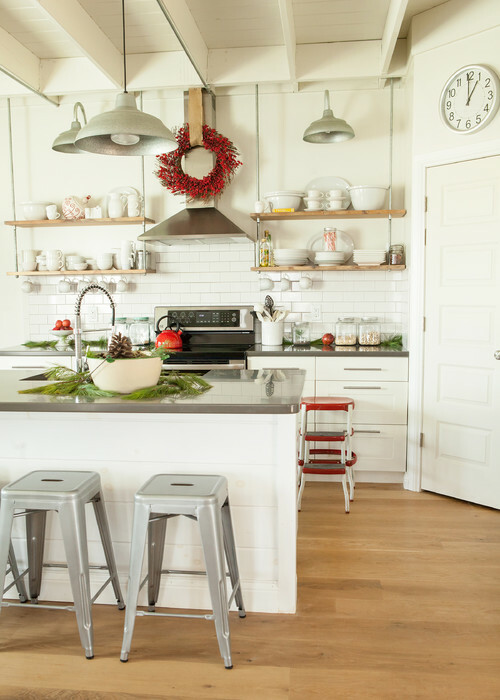 So, have you been inspired to decorate your kitchen for the holidays? Or are you ready to design the kitchen of your dreams? Why not get at it! Decorating for fall is one of my favorite things to do, except maybe decorate for Christmas! Hi I am Sara from Twelve On Main and am excited to be sharing here today! Sometimes decorating for the holidays can seem daunting. And there is always one space in my house that can be difficult to decide what to do. So, I have 5 different ways to style a coffee table for fall. I love styling my coffee tables and change them quite often. So, I thought I would spend a little time at home showing you how easy it is to switch them out. All you need are a few staple items that can be used throughout the year (no matter the season) and some season- specific items. These are some staple items that I always have in my home and use in different places throughout the year. They make it much easier to decorate a coffee table anytime. I definitely lean towards a more rustic/farmhouse feel in my home, and am going to use my round DIY wire spool coffee table as the base. This first way I decorate my coffee table for fall is with some books, white pitchers, and DIY white velvet pumpkins. Using books on a coffee table just make sense. I love using books in my décor and if you flip them with the spines of the books on the inside, the edges of the book create a very interesting look. I added one of my found deer antlers as well. My second fall coffee table is all about sunflowers, white pumpkins, and an easy DIY reversible sign. Once again I used some books to add height to the pumpkins. And again threw in that deer antler, because let’s get real. They just look cool! My third coffee table is all about pumpkins. I used my antique dough bowl as a landing place for all those pumpkins. Using real or fake pumpkins is totally up to you. I have found that I really like using faux pumpkins, especially if real ones aren’t available yet. I also added a plaid blanket draped to the side and that trusty old deer antler. I tell you, they work with almost any arrangement! My last two fall coffee table ideas are simple- which is what I love. What about a pile of books, topped with a few simple apples? Apples are so very fall since this is when the harvest happens. My last way to decorate a coffee table for fall is super simple. I love this faux farmhouse scale, and by simply adding some velvet pumpkins to the top, I have created a simple fall coffee table. Do you spy my little (big) pup hanging out? I can’t get away from him very much. He likes to be right where we always are. So, did you find some new inspiration when it comes to decorating your coffee table for fall? My biggest advice when styling a coffee table or anything else is to keep it simple. Don’t overwhelm yourself and shop your house to find some really great options. I hope you enjoy the rest of fall! If you are one of those that loved Halloween but doesn’t necessarily love decorating for it, then this post is for you! Hi there, its Sara from Twelve On Main. I love Halloween, especially since I had children of my own. It has brought a whole new excitement to the holiday. But…..I love to keep my home beautiful, chic, and stylish. I will dare to say that these two things don’t necessarily go hand in hand. Halloween is a really fun holiday to decorate for, if you like all the scary and spooky decorations. But, there are ways to create chic Halloween décor that keeps you festive for the holiday. I have 5 chic ways to decorate for Halloween today that are great ways to decorate for Halloween without compromising your aesthetic. A few tips that I would offer to create a chic Halloween space is to keep it simple, add neutral colors, as well as focus on one object being the focal point and keeping the colors to a minimum. Say you add a few black bats hanging from your front door, or some simple black pumpkins to a table. They can look chic while being simple and festive. The first chic way to decorate your home for Halloween is with a simple, yet appropriate themed wreath. Last year, I did not want to decorate for Halloween like I had in the past, and my kids started to complain! So, I whipped up a quick wreath that blended seamlessly into my outdoor décor. I made this grapevine wreath, with dollar store crows. Check out the full tutorial here. My friend Kathy from Up To Date Interiors has some really great chic Halloween décor ideas, and here is one example. 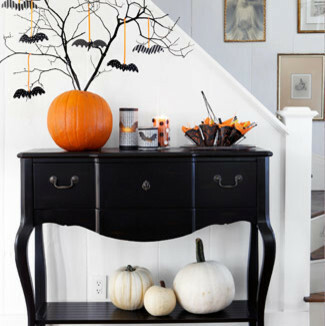 I love these simple black pumpkins sitting atop some chic candlesticks. It had that Halloween vibe without going completely crazy with the Halloween décor. Now, check out this gorgeous fall entry complete with white pumpkins, simple black tree branches, and bats! I love the way they all contrast against the black console. It is a great way to create chic Halloween décor. How about this chic black pom pom garland? It would be a great addition to your Halloween décor, without screaming ITS HALLOWEEN! I love it, and I think I may just have to make some! My friend Kathy at Up to Date Interiors has done it again with this pom pom Halloween décor. 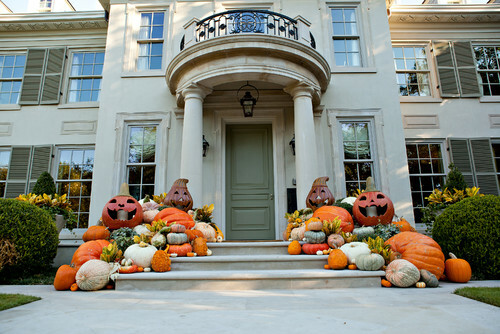 The last example of chic Halloween décor that I wanted to show you was this home bombarded with pumpkins. Using one material, the pumpkins, and keeping them as the focal point, it created a chic outdoor space. They have presence and are such a fun Halloween addition. I think that if I came across this home I would just have to stop and say Hi! Photo by Southern Botanical, Inc. So, if you are looking for some really chic ways to decorate your home for Halloween, try a few of these out and be the talk of the neighborhood! People are sure to take notice. Have a great day! Hey there, it's Sara from Twelve On Main. I am excited to be here today to talk all about late summer mantels! Well, guess what? I am going to say it. Summer is getting ready to say her goodbyes, at least where I live it is. Our fall starts as soon as September. But, if you are like me, you want to get the most out of the rest of those lovely late summer days. Why not change up your décor a bit too? Today I want to show you how to style a late summer mantel. Why would you want to style a late summer mantel? Well, it is a great way to transition your space to fall without adding a ton of fall décor. It is also a great way to introduce some fall décor elements without creating that fall feel. Sunflowers, or other late summer flowers. They are blooming all around my house right now so why not take advantage! These are not hard and fast rules, but adding just a few of these to your décor will add a touch of warmth as well as some texture to your space. There are a few things to think about when styling any mantel. I like to add something tall near the center. Once that piece is in place (this would be my antique day bed headboard and LAKE sign) I like to add items along both sides that will balance each other out. I rarely use the exact piece on both sides, which you can do. I like to add something large on one side, and then balance it with maybe 1 medium 1 small or 2 medium items. I used 1 large crock on one side, and 2 smaller pitchers on the other side. Here is how I used these items to style my summer mantel. I love adding fresh clippings of greenery. I used lilac clippings in my farmhouse pitchers and crocks to add some fresh summer appeal, making sure to balance a number of clippings in each. What about that fun hat? I threw that up on a whim, but loved the way it looked! Now, just by changing out a few things, I can style a late summer mantel with ease. I took out the greenery, and replaced it with some faux and real sunflowers. I loved the look of the different shades of sunflowers. Next, I added a few wooden elements with some of my birch candlesticks. The touch of raw wood definitely adds to the semi-late summer. Last I added a deer antler to the front of the LAKE sign which I decided to keep, because I am just in love with it. Plus deer antlers are indicative of the fall, so they can help transition your space. You can use real or faux antlers and get the same effect. See how simple that was? It seriously only took me about 10 minutes to change things out! I love my late summer mantel. If you are looking for a great way to update your space, try adding a few of these elements and warm up in preparation for fall.